Register Log In ECN Forum Forums Violation Photo Forum "I Do All My Own Work"
Or, so the guy told me. The fine arrangement of parts you see is how he ran circuits from his panel on the other side of the wall. First off, his hole in the panel failed to line up with his hole in the wall ... with just the tiniest slice - think "waning moon." The bit of EMT you see exiting the LB, naturally, is just sitting on the wood. Continuing his craftsmanship, he did not use a flex 90 connector, either. He simply bent the flex, and wrapped the end with electrical taps. So much for grounding! 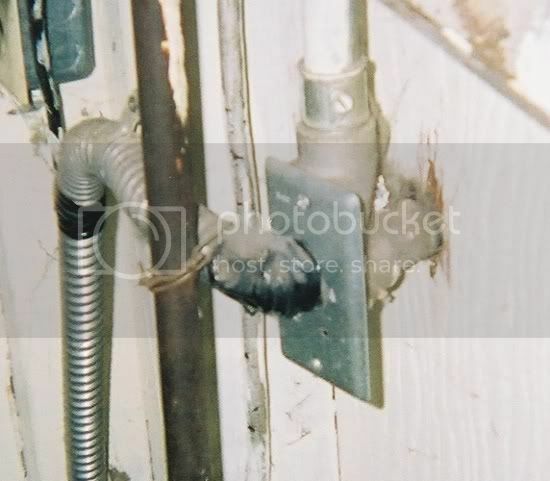 Please note the tie wire securing the flex to the gas line. This arrangement supplied power to the washer, the dryer, and the garage lights. Do I dare ask what your response was to his statement? The next statement should be, "Make sure you give a big donation to your volunteer (or paid) fire department. This way they will get here quicker when you need them!" Obviously he saved big bucks by using only one screw to hold the "cover" on the LB. Plus the extra "ventilation" helps keep the wires cool and therfore no derating is necessary. Agreed I see excellent workmanship like that every day as well! Weird how the more of it I rip out the more of it that seems to appear, each time a more "creative" install than the last! As the economy gets worse, people will be looking for more ways to get things done "cheaper". Hacks are always going to be around, as are qualified sparkies.